I can't wait to be on the receiving end of your creations, and to keep a life-long sharing of our hearts and souls in creative reverie. You're amazing. 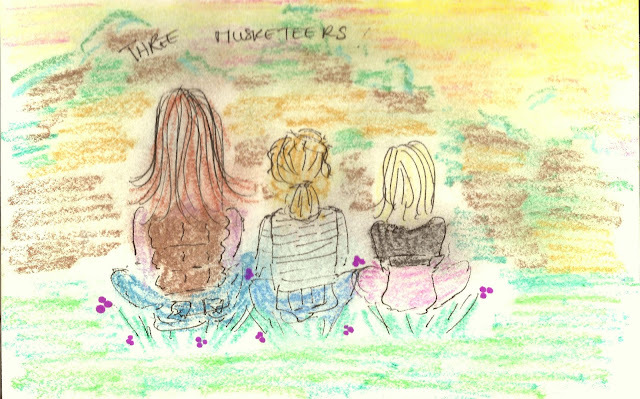 I love you (and this sweet, beautiful, love-filled drawing of you & your precious girls). And your writing is just gorgeous, my friend. HAPPY HAPPY HAPPY BIRTHDAY to you, my most beloved friend! You rocked it. You rock. Happy Birthday, dear Brooke. Thank you for the gift that you are. What wonderful presents we have opened these last twenty-nine days. Thank you x 29! Wishing you a new year of happy surprises! Much love to you and the other two musketeers! Thank you so much, Elizabeth. Thank you for taking the time to open each gift! I have so appreciated your presence here, and thank you for making it a real party to be at! I wish you the same year of beauty and surprises. Much love to you, dear Elizabeth, and so much gratitude.